What we maybe should've realized sooner was that we are running a political campaign and the candidate is Uber... And this political race is happening in every major city in the world. And because this isn't about a democracy, this is about a product, you can't win 51 to 49. You have to win 98 to 2. Uber CEO Travis Kalanick raises an important issue. Most people think that the sharing economy is all about convenience and the power of networked technology. But the biggest risk for sharing companies does not emanate from technology but from a failure to manage social expectations around it. Creating a sharing market is all about redesigning institutions. When new sharing products are introduced, established institutions tend to be skeptical. Criticism against Uber's ride-sharing app, for instance, has mainly come from four institutions, each looking at Uber as a veritable threat: consumers complain about safety and privacy; workers have social justice concerns; city regulators worry about structural integrity; and journalists admonish Uber's lack of accountability. So what allows managers trying to establish a sharing business to win the political race? My colleagues Anton Siebert, Ela Veresiu, and I are currently studying this question. For the last seven years, we've been ethnographically tracing Uber's every move. Our answer is surprisingly simple: empathy. From a market design standpoint, it is a sharing market's potential to challenge established balances between economic and social interests that creates much resistance. By taking the place of more formal structures of social protection and redistribution, sharing markets shift agency and mandates from larger institutions such as unions and regulators to individual market actors. "Market empathization," a fourfold strategy process through which a specific stakeholder complaint can be addressed and "a cultural good" is repositioned from the institutional domain to the domain of individual market-mediated empathy can help manage this shift. How does market empathization work? To illustrate the process, let's use an actual complaint, for instance, the idea that "Uber undermines consumer safety." The first step is humanization, the act of repositioning consumer safety away from the bureaucratic, mechanistic, and rigid level of formal regulation and towards the more self-regulating and flexible domain of individual care. Not the "iron cage" of old days will ensure our safety, but humans in caring interaction will. You may have probably heard somewhere recently that we're hard-wired to care. There is a deeper strategy behind this argument and it is called universalization. Just asserting that consumer safety is everybody's concern is never enough. During universalization, the empathetic concern for the other's safety must be positioned as something that is intrinsic to us as human beings and that, for this reason, we don't really need binding rights for consumer protection. Third, prototyping refers to the education of individuals in the sharing network to act respectfully and caringly towards one another by creating role models and circulating their success stories. Through the communication of ideal types on Uber's website, for instance, Uber drivers systematically learn how to be empathetic agents in the context of helping and caring for their consumers. Lastly, during contracting, moral agreements with targeted stakeholder groups are established through voluntary policies, consumer safety guidelines, and mutually beneficial partnerships. Through contracting, individual, self-regulating ethical conduct gradually takes the position formerly held by legal institutions. What appeared as (and in fact is) a threat to established arrangements of economic and social goals has now been redefined in favor of an economic system that prioritizes sharing over formal social regulation. When Uber CEO Travis Kalanick describes the creation of a sharing market as a "political campaign," he is ultimately referring to the managerial challenge of redesigning regulatory structures and expectations about where an institution's traditional mandate ends and the empathy of individual market actors begins. 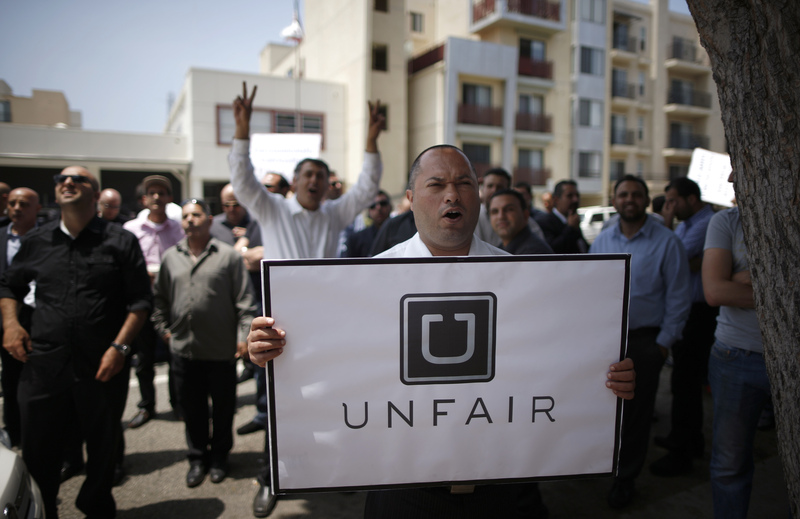 As the rise of Uber shows: when creating a sharing market, sharing is quite literally caring.